After a recent pottery class, I gave away all the pots I made. It wasn’t that I didn’t like them; I intended them as gifts. What I kept for myself was the pleasure of crafting them. I enjoyed most of all the preparation. First, I got to don an apron, which is the best costume I can imagine. I felt like a real artist right away. It even came clay-stained. I sat on a wooden stool in an old warehouse-turned-art-studio and listened to instruction by a older lady teacher with dyed hair and hip hugger jeans. She talked a mile a minute; couldn’t say enough about this artform she loved. Next, I had to figure out how to orient to the wheel. How close should I be? How hunched over, how close in should my knees and elbows tuck? Then came the clay: How much pressure, and how, to apply with my hands? Was I breathing? All this finagling determined how well I got the clay centered on the wheel so I could actually work it into some kind of vessel. I never knew at the outset what I was going to make. I let the clay rise and fall, narrow and widen between my fingers and enjoyed equally a tall vase-like structure and a squat bowl-y thing. The process was the goal of the class. But I couldn’t exactly give that away: my roughened hands nor the slime that meant the clay was getting smooth. I couldn’t convey in anything other than the pots my pleasure in making them. They made good Christmas presents. The class, and in particular my ambiguity toward keeping the pots, made me ask: what is the relationship between practice and art, doing and making, making and product? In March’s NOLA studiola blog, I further explore this question through a project in which I narrate a recent trip to New Orleans to see Alison Barker. 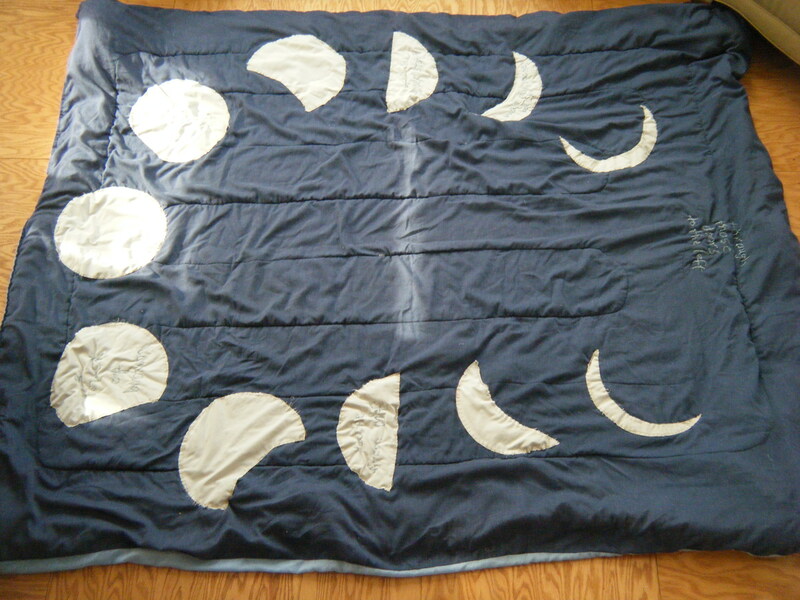 I sew snippets of conversations from the trip into a moon phase design on a quilt. On the blog, I write more. What does a quilt about a trip have to do with making pots? Well, in both cases I’m curious about my interest in process over product, or, supposed goal. I took two days each way on a train to get from Minneapolis to New Orleans and spent one and a half days in my destination city in between. The quilt that commemorates this journey is a lowly article, a cast-off blue blanket I got at a thrift store and which covered my son’s bed for years until he complained all the stuffing was gone and it wasn’t keeping him warm anymore. It looks like the sky and I had an old grey sheet, in equally rough shape, that looks like the moon. Voila, a canvas for a wannabe seamstress. The product in both cases is an excuse to work with the materials. The materials, in the case of the quilt, include the trip itself. What to include in its tale? What to leave out? Why this medium? Who is the audience, or, rather, who are the recipients? Besides the excuse to think more about how I create, what’s my purpose in this project? As I worked on the quilt, answers came to me. In one episode I record, I’m eating dinner in the dining car with strangers, a mom and her squirrel-y son. She was on her way to her father’s funeral. The next day I sat with another daughter on her way to visit a dying mom. I felt the urge to do something for these women but there was nothing to do. I’ll never see them again. Yet they remain with me. I think of them as I work. So, I dedicate the quilt to all my fellow travelers. You’ll all be fellow travelers after you accompany on this journey.